What Happened to the Money you Donated to IKF? The IRS was notified that the relationship of the Donor to the Donee was “NONE,” despite the fact that each of the grants were made to funds in Pakistan founded by Imran Khan and/or controlled by his political party, reveals AP investigation. 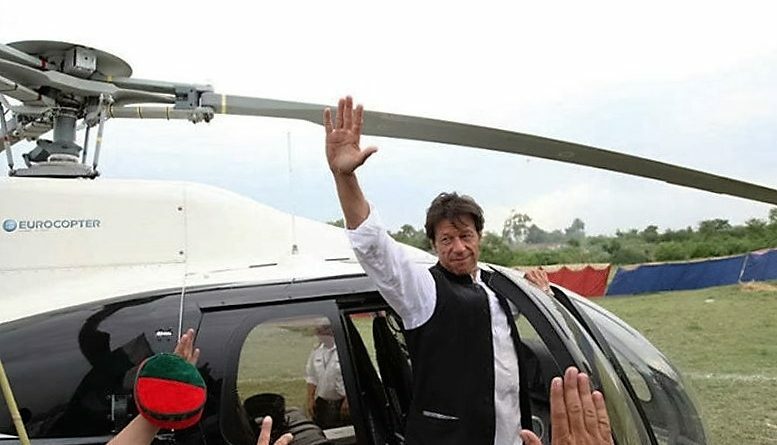 AP found out some not-so-transparent dealings by the United States’ branch of Imran Khan Foundation in the way they distributed your money which was collected as Flood Relief donations. 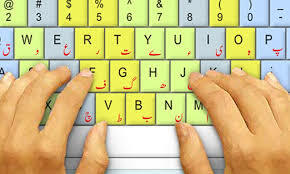 The Imran Khan Foundation (IKF) is a nonprofit corporation showing an address of 385 S Lemon Ave, Walnut CA 91789. IKF is a registered tax-exempt public charity under section 501 (c)(3) of the United States’ Internal Revenue Service Code. As such, contributions to the Imran Khan Foundation are tax deductible. Interestingly, the Board of Directors of the IKF are also close aides to Imran Khan’s political party, Pakistan Tehreek-e-Insaf (PTI). AP investigation team obtained various documents from Internal Revenue Service (IRS) of the US Treasury Department. 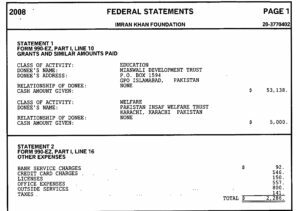 The IRS form 990 for the Imran Khan Foundation from 2007-2014 were carefully evaluated. 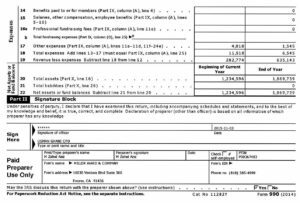 IRS Form 990 are all public documents per IRS code and they are required to be filed by each non-profit organization on a yearly basis. These documents can also be obtained from a publicly accessible database on the US Treasury Department. 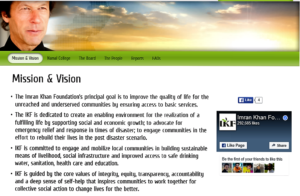 The Mission Statement of IKF is very ambitious and ” its principal goal is to improve the quality of life for the unreached and underserved communities by ensuring access to basic services”. However, the statement given on IRS Form 990 is much narrower in scope and it reads “promote education and provide technical training for underprivileged rural areas of Pakistan”. 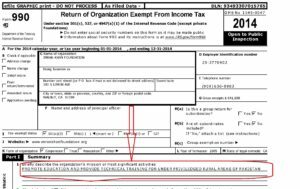 The IKF ignored multiple requests to clarify as to why this apparent emphasis on education and technical training on the IRS forms and much broader focus on their own website. 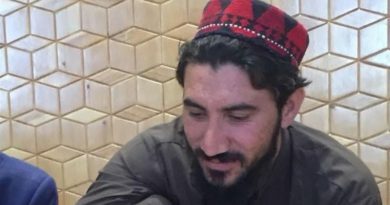 According to the IKF’s IRS Form 990s, obtained by AP investigative team, the organization raised funds in the United States and transferred those funds to relief efforts in Pakistan. The actual destination and use of these funds, however, is not always clear. Between 2007 and 2010, IKF transferred about $187,000 to Pakistan. 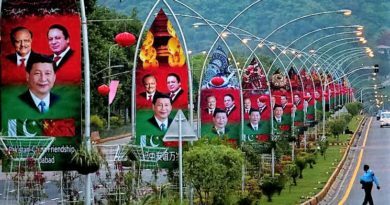 The reported recipients were the Mianwali Development Trust, Namal Education Foundation, Pakistan Insaf Welfare Trust, and Swat Relief Fund PTI. 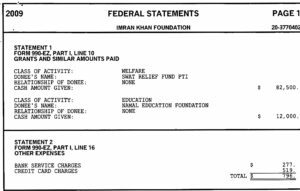 For each itemized overseas grant made by IKF, the IRS was notified that the relationship of the Donor to the Donee was “NONE,” despite the fact that each of the grants were made to funds in Pakistan founded by Imran Khan and/or controlled by his political party PTI. That’s not where the ambiguity ends, In 2010, presumably in response to the historic flooding in Pakistan, IKF reported revenue totaling $5,956,654. However, only $144,851 was reported in expenditures that year. This amounts to a major discrepancy. In 2011, IKF reported revenues of $793,903 with expenditures of $372,858 leaving $6,240,269 cash on hand at the end of 2011. It wasn’t until 2012, that IKF made a large financial transfer, this time in the amount of $5,501,205. That distribution was reported as having been made as an unspecified cash donation in Pakistan. This is not conclusive of anything because we do not know how the funds were actually used in Pakistan; but the timing does raise questions given that PTI was in the midst of a national political campaign when $5.5 million in tax-free charitable funds were transferred from the US to Pakistan – especially given the IKF’s history of using funds for “relief efforts” tied to a political party. At the end of 2014, the IKF showed a net worth of 1.87 million dollars. There is no easy way of finding out where did all that money go, because both IKF and PTI ignored all requests to clarify their position. However, the public has a right to know where and how their donations were utilized. It is also worth mentioning that Imran Khan runs several charity organizations including but not limited to Shaukat Khanum Memorial Trust and Imran Khan Cancer Appeal, UK. regarding ambiguity in IRS forms it is not unusual to write brief couple of line regarding what is the source of earning and for what. Everyone does not give details of how are earning money until they are asked for it. Whole article is on assumptions, it does not have any proof of any corruption.